What are your monuments made of? The monuments are made of a linear low density polystyrene that is UV stable. They are Weather Resistant and come in Non-Fade Colors, the same material that the better playground equipment is made from. We parked a 4500 pound tractor on the commemorative monument to show how strong and durable they are. 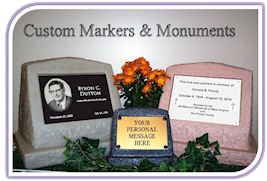 Can I use your monument as an urn? Both of our monuments have a recess, water tight bung in the bottom that lets you put your loved ones ashes inside, or you can fill it with sand for added weight. The commemorative monument (large one) weighs 6 pounds empty and 45 pounds when full of sand. The memory monument (small one) weighs 1 pound when empty and 7 pounds when full of sand. Are your monuments allowed in cemetery? We advise you to review the rules put in place by your cemetery. Some only allow flat markers, or have other restrictions.